From elephant trunks to octopus legs, nature abounds with tentacles that are adept at precise manipulation. At Kraken Robotics, we wanted to see what nature could teach us about better manipulation methods for launching and recovering marine vehicles and equipment. Inspired by the sophisticated feedback loops and dynamic response times found in creatures such as the elephant, octopus and jellyfish—and even the occasional carnivorous plant—we undertook an 18-month research and development program into biomimetic design. Getting into or out of the water is by far the highest-risk operation for any piece of oceanographic equipment. It involves multiple dynamic components, impacted by wave heights, vessel motions, wind direction and currents. Since equipment is delicate and costly, great care must be taken during its launch and recovery. Kraken’s Handling Systems Group, based in Dartmouth, Nova Scotia, spearheaded the R&D program. The lessons we learned, and the knowledge we acquired, culminated in the development of the Kraken Tentacle Autonomous Launch and Recovery System (ALARS). By developing an integrated sensor, platform, and LARS in house, we provide a fully operational, reliable package that’s supported by a single vendor and requires only electrical power from the host vessel. Designers of handling systems often go to outside manufacturers for the winch and then integrate it into their launch and recovery system. Early in the research for the Tentacle, we recognized that the winch should be the heart of the system, with the potential to provide much more than just cable pay out and reel in. As the main driver in the launch and recovery process, the winch could be designed to significantly compensate for ship motion and vehicle motion. Like its namesake in nature, the Tentacle Intelligent Winch may look unassuming from the outside, but its true capabilities lie within. The fully integrated electronic control module hosts sophisticated algorithms for dynamic manual, semi-autonomous or fully autonomous control of the winch. The integrated motion reference unit tracks the motion of the host vessel, and the sophisticated onboard software models and predicts the sea state. This allows the winch to predict timing of wave peaks and troughs and optimize the variable torque on the motor to minimize input disturbances through the tow cable. The operator can achieve manual control of the Tentacle Winch either through manual switch inputs similar to those in traditional systems, or remotely via secure Ethernet and Wi-Fi interfaces. A semi-autonomous mode allows for dynamic surge (front/back motion) and heave (up/down motion) compensation to minimize input disturbances on the tow cable even in high seas. A fully autonomous mode allows the KATFISH tow body to command the winch. As water depth increases or decreases, the KATFISH can autonomously measure the depth and command the winch to reel in or pay out. This enables increased safety, allowing for fully automated bottom-avoidance maneuvers even in dynamic environments. The Tentacle Winch is designed to be both intelligent and robust. It meets military shock and vibration requirements of MIL-STD 901D as well as the strict international standards of Lloyd’s Register and DNV-GL codes. It is a fully electric system, providing improved response times and eliminating the need for secondary hydraulic power units. And it can be integrated on a wide range of vessels, from small unmanned surface vessels to large offshore support ships. In nature, we often hear reference to reflexes and muscle memory of creatures, including humans. Reflexes can be broadly defined as an action or actions which occurs before the brain is consciously aware of the stimuli, and separated into two categories; withdrawal reflexes, and conditioned reflexes. In this article we will focus on the latter. Conditioned reflexes, commonly referred to as “muscle memory”, are reflexes which have been acquired as the result of experience. In the case of humans, an example is the catching of a ball; as a child, we are taught this simple action of throwing and catching through play. As an adult, when a human is thrown a ball, they will instinctively reach out to catch it before it falls to the ground, and reflexes ensure that balancing muscles are tensed, and tiny adjustments are made to compensate for the expected weight of the ball. To return our analogy into the realm of marine equipment, we compare a human operator of a standard hydraulic winch or LARS. A young deckhand most likely requires extensive training and time at sea to understand the dynamics of vessels and interactions with the ocean. In contrast, a well-seasoned sailor with years of experience has “trained” themselves to monitor the motion of the vessel, wave conditions, the timing of the launch or recovery of equipment with the period of the waves and swell, often without thinking about it. This experience can be likened to a conditioned reflex, in which the human is performing many actions so quickly that they are executed without conscious thought. It is precisely these biologically conditioned reflexes that we aimed to mimic in the design of the Tentacle Winch and embodied into the Tentacle Control System. The primary objective of the Tentacle Winch is to increase the performance envelope of the launch, towing and recovery of a sensor platform such as the KATFISH system. It achieves this by reducing the coupling of unwanted surface vessel motions into the towed sensor platform, which is essential to maintain the stability and safety of the towed platform. Motion compensation systems designed for decoupling of vessel motions can be either passively or actively controlled. Although passive systems are typically simpler, they are limited in the frequency and magnitude of motion they can decouple and can cause resonance issues due to the inherent natural frequency of the passive damping system (such as in a spring-damper). Fortunately, with advances in control system technology, active systems are becoming much less complex and less expensive. Most active systems compensate for heave motion. However, for small surface vessels such as USVs, surge motion can be a major factor, especially when the trail—the distance behind the towing vehicle—is high compared to the depth of the towed body. Because of this, we’ve designed the Kraken system to compensate for both heave and surge. A flying sheave system consists of a sheave mounted on a linear motion device such as a hydraulic cylinder. The cable is wrapped 180 degrees around this sheave, and the cylinder moves in and out, effectively changing the cable length to compensate for the vessel motion. A nodding boom system has a sheave, over which the cable passes, mounted on the end of a boom that is driven up and down to compensate for the vessel motion. A winch drive system takes the motion information and then pays out or reels in the cable to compensate for the calculated heave and surge motion. The Tentacle ALARS employs a winch drive system due to the overall space efficiency, and unlimited magnitude response due to the large cable length. The Tentacle Control System within the ALARS is both the brain and the nervous system, sensing stimuli, processing feedback and generating actions automatically. It consists of two components which operate in tandem; the low-level (subconscious) control system, and the high-level (conscious) operator control systems. The low-level control system is akin to the conditioned reflexes observed in nature and in humans, monitoring sensor stimuli and reacting almost instantly without conscious thought. Four key features of the low-level control system are its Active Motion Compensation, Active Terrain Following, Constant Tension and Auto Render. The Active Motion Compensation (AMC) module is the main feature which separates the Kraken Tentacle Winch. 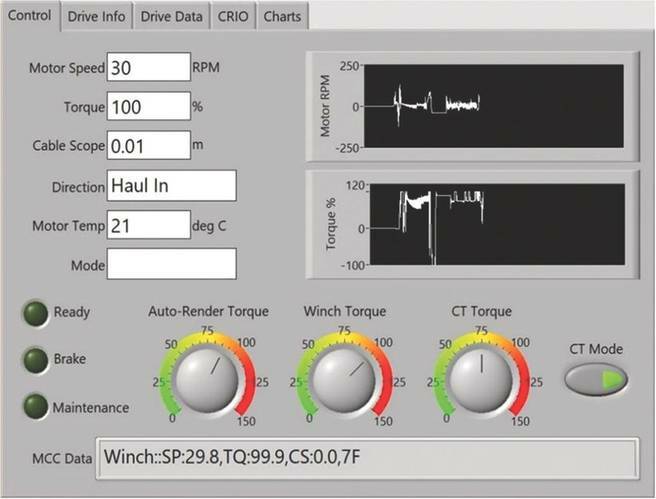 Using a series of proprietary motion tracking and motion prediction algorithms, the AMC system is continuously tracking the motion (speed, orientation, position) of the host vessel and the motion (speed, orientation, position) of the KATFISH, and calculating the necessary speed and torque it must apply to the winch and tow cable in order to compensate for the vessel motions. The AMC module operates autonomously, without human interaction or conscious thought, and effectively decouples the host vessel motion from the KATFISH, drastically increasing the operational envelope of the KATFISH system. The Active Terrain Following (ATF) module allows the KATFISH to command the winch. 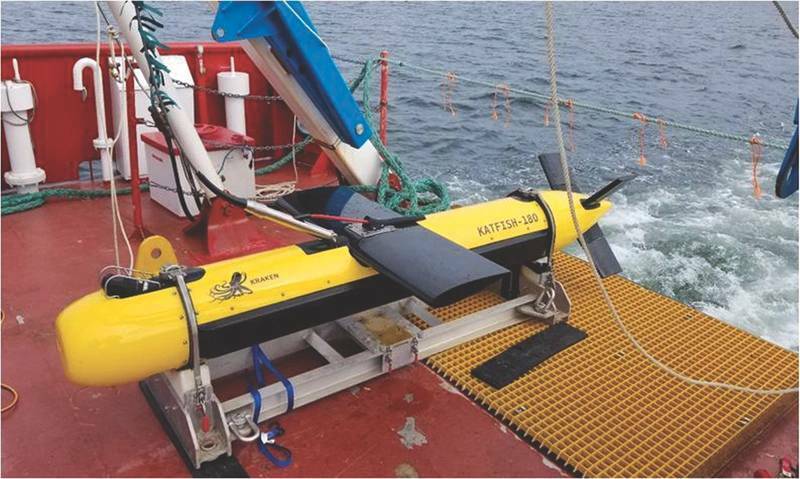 In this case, the KATFISH detects that the seabed is rising or falling and issues a command to the ATF module to automatically adjust the cable scope to help the KATFISH actively follow the terrain. 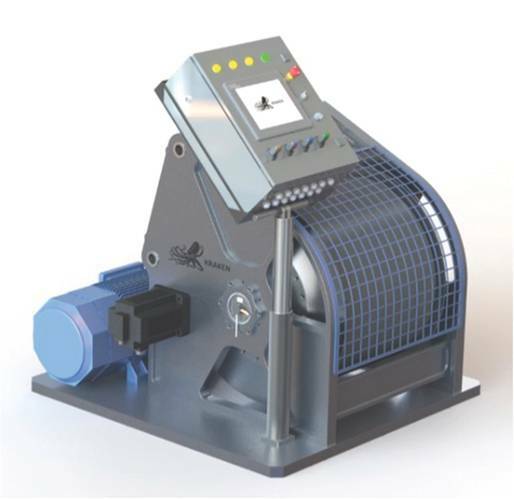 The speed of the cable payout or reel-in is monitored and adjusted, and in the case of emergency conditions such as bottom avoidance, the cable can be reeled-in with great speed. The Constant Tension (CT) module, as its name suggests, is intended to maintain a constant specified tension on the tow cable. This is calculated based on feedback from the torque sensor in the motor and is very effective at eliminating sudden tension impulses on the tow cable due to waves or small surges. This module also allows the winch to hold the KATFISH in the docking head during launch and recovery without an additional capture mechanism. The Auto Render (AR) module provides a fail-safe feature that allows the system to automatically pay out cable if the tow load exceeds a pre-set threshold. In the worst case that the tow body impacts the seafloor, or entangles itself on other marine gear, this cable payout can help to “free” the tow body and minimize the risk of damage to the tow body while eliminating any risk of cable breakage. The high-level control system is akin to the conscious actions of a human operator, and allows for control of launch, deployment and recovery to be fully manual, remote or autonomous. We designed the control system to be flexible, using Ethernet and Wi-Fi communications throughout so the entire system can be integrated easily with other shipboard systems. The high-level control system is made up of an operator control panel, electrical control panel, winch and actuator motors, and a variety of limit switches and sensors to limit range of motion and detect the correct launch and recovery of the KATFISH. The operator panel consists of a touch screen, manual controls and indicators. The touch screen (which can be used with gloves, in real-world weather conditions), provides the operator with current and historical operating data, configuration of operating parameters and alerts and warnings. The status of the autonomous controllers is continuously monitored, and real-time information is broadcast over the Ethernet and Wi-Fi interfaces. Operators can wirelessly monitor the operating status and view key data such as cable direction, scope and speed and critical parameters such as motor temperature and cable load. Safety is priority number one in any marine operations, and Kraken has taken this to heart within the design of the Tentacle. Although many creatures can survive and regrow severed limbs, humans are not one of them. The Tentacle Winch includes a variety of autonomous controllers and intelligent modules, all of which prioritize the safety of the human operator and any other deck personnel the above all else. We made sure that the safety features were clear and easy to use. Each control panel has an emergency stop (E-stop) switch; the operator panel has an additional E-stop that can be connected on a flying lead. When the E-stop is pressed, the system immediately stops motor operation and disconnects power to the motors. A variety of warnings on the operator panel also alert the user to parameters that exceed pre-set operating thresholds. A movable light stack with audible alert provides a visual and audible indication of the operating status. We believe the Tentacle Autonomous Launch and Recovery System and Intelligent Winch technology is an excellent platform for further development. It is a versatile combination of key enabling technologies, and each of those technologies is fundamentally scalable for larger (or smaller) applications. In an effort to mimic the memory of a typical human, the onboard memory of the Tentacle Winch records all motion data within the system and any significant motion events (over temperature, excess torque, excess tension, etc.) This data can be used to automatically tune the control system modules through machine learning techniques, improving the response times and overall performance, furthering conditioning the reflexes of the Tentacle. One example future application under consideration is supply ships and other vessels that experience relative motion issues. These vessels would benefit greatly if the motion compensation system were augmented by motion data from a floating target platform. The system could then determine the relative motion between the host vehicle and the target platform and adjust the cable length so the target would see no relative motion between the cable end and the platform. As more sophisticated motion control technologies become available, they can be easily incorporated into the Tentacle system. Like its namesake in nature, the system is strong and flexible. David Shea is Vice President of Engineering, Kraken Robotic Systems Inc.